A twofold actor, Vittorio Gassman is one of the most distinguished tragedians of the Italian theater, whereas without comedy he would have never become really important in films. The same age as Tognazzi (he was born in Genoa in 1922), he began to make a name for himself in a completely different field, that is as a basketball player, who took part in two first division championships and several international meets. Then, like Manfredi but a few years earlier, he graduated as an actor from the National Academy of Dramatic Art and made his stage debut during the war, in 1943. Tall, good-looking, dashing, gifted with one of the most beautiful voices in the Italian theater, he was naturally fated to become a great dramatic actor. Making lightning progress in only a few years, he also made a name for himself abroad, for example in Paris and London in 1948 where he appeared as the Messenger in Sophocles' OEDIPUS REX. The next year he was appearing in leading roles: Shakespeare's TROILUS AND CRESSIDA directed by Luchino Visconti, Euripedes' BACCHAE, Shakespeare's ROMEO AND JULIET, Goethe's IPHEGENIA IN TAURUS. A further step ahead, in 1950 he took on his first production as stage director with Ibsen's PEER GYNT. From Seneca to Aeschylus, Japanese No to Pirandello, Dumas to Tennesse Williams, Cocteau to O'Neill, there was no great playwright in the classical and modern theater that he hadn't brought to the stage. Naturally, the movies immediately noticed him. 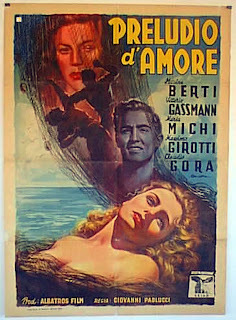 In 1946 he made his film debut, in fact, in the starring role of PRELUDIO D'AMORE (PRELUDE OF LOVE) by Giovanni Paolucci. But producers didn't seem to have put their finger on his particular type, exploiting in various ways his impeccable professionalism. Giuseppe De Santis' RISO AMARO (BITTER RICE) would type-cast him for many years as the "villain". Nor would things change very much during his Hollywood experience in several above-average films directed, among others, by people like Robert Rossen, John Farrow, King Vidor, Irving Rapper, Richard Fleischer. Motion pictures, which sought him out precisely because he was the type-cast "villain", especially in supporting roles, were considered nothing but a way of making money by the actor; personal satisfaction came exclusively from the theater.